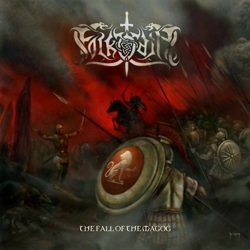 Epic folk metal group Folkodia has recently released its 6th full-length album “The Fall of the Magog“. It is a historic album, since one month after its release, their founding member Ruslanas Danisevskis aka Metfolvik (also in Ravenclaw, Folkearth) passed away, losing his battle against cancer. Metfolvik was from Lithuania and several years ago he had the idea to create an international Viking folk metal band, gathering various musicians around the world. His plan became reality in 2004, when he founded Folkearth. After their first releases, he decided to form a second band, with many band-mates from Folkearth, as he wanted to expand beyond the Viking thematology. So Folkodia was born in 2007, giving the opportunity to its band members to add elements from their local folklore, both in music and lyrics. After 5 full-length albums (one of them totally acoustic), Folkodia return on May 2013 with “The Fall of the Magog“, released by Stygian Crypt, like 4 of their previous works. Except for the lyrical concept, Folkodia’s music is close to Folkearth’s, something natural since they both move in the same genre, with almost the same band members. “The Fall of the Magog” hosts 11 musicians from 7 countries (Greece, France, Lithuania, Italy, Monaco, Argentina and Germany). It includes 10 songs with a total duration of 42 minutes. It is a typical release of the band, for those who have listened to their previous works. They play epic metal with folk and extreme metal elements, combining epic riffs and melodic lead guitars with several traditional acoustic instruments and various vocal types. The sound of their guitars is closer to classic epic heavy metal, including some wonderful solos and a few faster outbreaks with extreme metal elements. Apart from acoustic guitars, their traditional instruments’ repertoire includes accordion, cello, bagpipes, nyckelharpa and hurdy gurdy. Their vocals are once again very variable and there are 5 different singers in the album. Death metal growls, epic clean male vocals, choirs and female vocals, all of them in a very good level. Compared to their earlier works, Folkodia sound now like a band and not as a compilation. It seems that as time passes by, its members cooperate much better, something very difficult though, since only few of them can actually meet each other. ”The Fall of the Magog” has only two composers, Gianluca Tamburini and Michaël Fiori. This obviously resulted in a tighter and more solid sound with common atmosphere throughout the whole album. All lyrics are in English and except for one song they are written by Marios Koutsoukos (Dol Amroth, Athlos), dealing of course with epic mythological themes.